Swim instruction is a staple of the Camp Echo Lake program. Like all other activities in which the campers participate, swim classes are conducted with the idea of ensuring that each camper moves through a progression of skills specifically targeted to improve swimming ability and build competency in water safety. The Junior campers have an instructional and a general swim period almost every day. The Inter campers have either an instructional or general swim period daily. 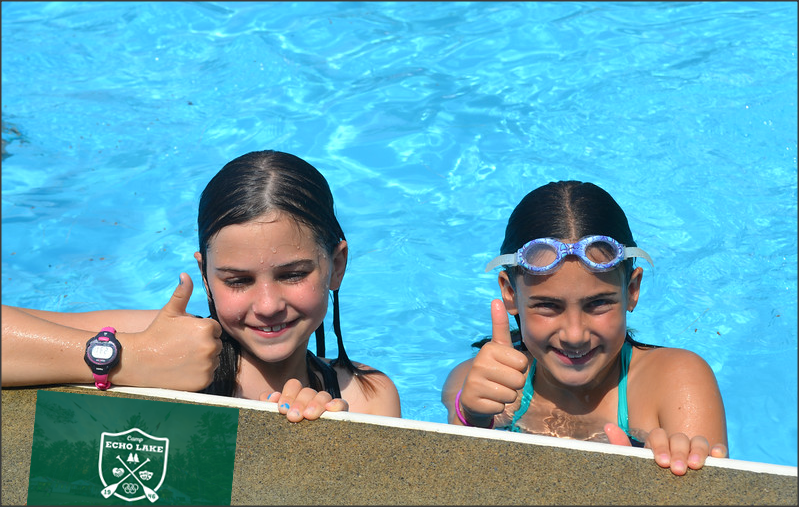 Our Senior Village campers have general swim, and may also choose other water-related activities as an elective. During the one-week waterfront staff orientation, our staff is guided through numerous scenarios designed to help them create lesson plans that are both age and skill-level appropriate. The lessons are designed to target the six Red Cross swim levels, and also to be enjoyable and motivating to our campers. Each of the Red Cross levels contain specific stroke competencies for the campers to demonstrate before moving on to the next tier of skills. In addition, each level contains an important set of safety skills that align with the technical skills that the campers learn. A record of each camper’s swimming progress is kept at the end of every summer. Returning campers are placed the following summer based on the highest level that they attained the previous year. I personally assess new campers individually, using my 20+ years of experience as Waterfront Director to make initial placements. Classes are very small – with a 1:6 ratio on average – and are designed to make sure that each camper gets as much individual attention as possible. Our waterfront staff submits written lesson plans that I review and keep on file for future reference. During the summer, the waterfront staff frequently works together to brainstorm and come up with the most effective ideas and teaching techniques, so that we keep our approach fresh and motivational for the campers. Campers who want (or need) additional swimming instruction will find it readily available. This instruction is scheduled during times that will not interfere with their other activities. They may participate in 1:1 or 1:2 sessions designed to help them meet individual swimming challenges related to the Red Cross program. We also offer the same degree of extra help for more experienced swimmers who want to improve their strokes for competitive swimming, or just for their own swimming enjoyment. NOTE: This is part 2 of 3 in the Waterfront series. Click here to read part 1.